One costume I have been working on for a little while, that I plan to wear to this year’s Emerald City ComiCon, is the Female Romulan Commander from the Original Series Star Trek episode: The Enterprise Incident. It appears to be a pretty straightforward outfit, and in fact there are some good resources online about recreating the dress. (See the end of this post) It wasn’t until I tried to find the fabric that I realized it wan’t quite as easy as I had thought. Both fabrics, in my opinion, are pretty ugly. Compared to the Romulans from Star Trek: The Next Generation, however, her outfit seems divine. The gold fabric seems to be some sort of thick upholstery type, and if you look really closely, it actually has a sort of interlocking chain pattern to it. The ‘red’ fabric is of a similar weight, but has a more soft ‘knit’ type look to it. Now I say ‘red’ fabric, but in the actual costume they used in the show it is a magenta-ish pink color. I’m not clear on exactly why, but something about the cameras they used then, or how it was broadcast made it appear red on screen. So it wasn’t until the remastered edition of the show was released that it looked the correct color in the episode. Originally, I was sure I could find something close to both of these at my local fabric store, since it has a home-decor section with several types of upholstery fabric. No such luck. Well, I thought, you can find EVERYTHING online, right? Again, I probably could have found someone who would weave it for me or something, but not within my limit of time and money. (I decided on this costume a little over a month prior to the convention.) So no luck anywhere I looked online, though I found a couple fabrics on eBay that I would settle for if I had to. After visiting a couple more stores, and even one that specialized in just upholstery fabric, I decided I would have to go with what I had found on eBay. I went with a gold and black diamond-print upholstery fabric for the main part of the dress, and ended up getting a red and black shawl with a large houndstooth print for the ‘red’ part. Now something with a triangle print would have been far better for the ‘red’ part of the dress, but I could not find anything of the sort. If I had had more time, I would have crocheted something myself. 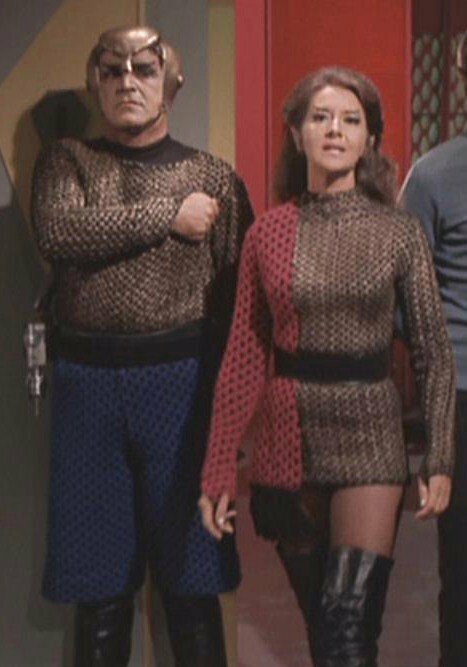 In one of the forum threads I found on this costume, I noticed someone had made one of the male Romulan uniforms using large houndstooth for the ‘red’ part. Not perfect, but it gave the right impression, which is why I went with the same print myself. Now you’d think houndstooth would be easy to find at fabric stores… And it probably is in Fall. My local fabric store had a few, but they were all too small, or the wrong color, and the largest print that was white and black, didn’t seem like it’d take dye well. (Though I don’t know much about dying; that is an area I need to look into more.) They even had a blue one that would be perfect if you were doing some of the other Romulan uniforms in that episode, great texture and everything. But no red, and certainly no magenta. I ended up going with a shawl on eBay, (More of a wrap, I guess, since it was one big piece of thick woven cloth, but you get the idea.) because I could not find anything close on there in fabric, and the shawl had a thicker texture than if I just went with some completely flat fabric. Unfortunately, the fabric from the shawl likes to unravel as soon as it is cut into, but I expected that. I just was vary careful with the fabric as I worked with it, and every time I made a seam with it, I used straight stitches in two spots, and a zig-zag stitch in between. It’s been doing great so far, and doesn’t seem to be coming apart no matter how much I pull at it and try it on, now that it is sewn. 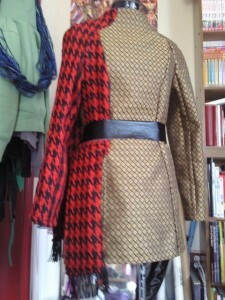 (The belt is separate from the actual dress, but all the ‘scarf’ parts are attached.) I started with a sewing pattern for a dress from Burda which I shortened greatly and didn’t use the slits at the bottom. 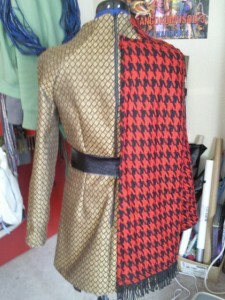 I used the gold fabric for everything but the right sleeve, and the top half of the right front panel of the dress. I sewed on the scarf pieces that dangle and the fringe after the rest of the dress was done. I also have some elastic that I am going to use on part of the sleeves to make a little piece that goes over my thumbs. So it isn’t perfect by any means, but I think it works, and I am excited to wear it! As far as accessories go, I already have over-the-knee length black boots I will wear. I had quite the time trying to get the right ears, though… It’s hard to see in the one picture I posted, but basically, she has the same type of ears as Spock. (Or any other Vulcan or Romulan on the show) There are tons of these things available online, and after considering price and usability, I decided to go with the officially licensed Spock Ear Tips by Rubies costumes. I had read some reviews, and people said that the ear tips weren’t always the right color, but they generally stayed on, looked decent, and were less fake-looking than the full ears by the same company. I ordered the ear tips from a costume seller on eBay, but when I got them, it was the full-ears they had sent, instead. When I asked them about it, they told me that the company had supplied them with the wrong picture, and that they didn’t have any of the tips, just the full-ears. They were really nice about it, and refunded my money while letting me keep the full-ears, so no complaints there, other than them not having the correct ones in the first place. I started looking around on the Amazon reviews more, and from what I can gather, up until a couple months ago, people were still getting the ear tips fine, but then I started seeing reviews where, just like me, they had gotten the full ears when the ordered the tips, and the sellers that had ordered from, told them basically the same thing I was told. Apparently Rubie’s changed over to just selling the full-ears, but they kept the same item number, and so all the sellers still had the image of the ear tips. I thought there still had to be some of the tips out there, though, so when I found a seller that only had one left in stock, and all the reviews were for the tips, I decided to take a chance and order them. Sadly, I again was sent the full ears. When I contacted that seller, they sent me some non-licensed ear-tips by a company called Don Post, but after trying them on, they just don’t cut it. They are too thin, way too far off from my skin color, and they aren’t even the same as each other. They also stick out really weird, and I think to get them right, I’d have to use so much spirit gum and makeup that it wouldn’t be worth it. So even though they are pretty fake looking, I am going to go with the full Spock ears. I think I can style my hair so it covers most of the ear with just the tip out, and despite the way the colors look in the photo below, they match my skin-tone better. They also stay on without spirit gum, and stay closer to my head, more like real ears. Licensed Spock ears by Rubie’s costumes on left, and ear tips by Don Post Studios on right. The Spock ears look a little less brown in person, and the others look a little more orange-pink. This, and all Mae-Chan’s other ‘Outfitting the Ranks’ posts are really great when you are working on Star Trek costumes. You have to wade through the discussion, but there are many good ideas and information tossed about.